Place 7 cookies into a resealable plastic bag. Seal the bag and crush the cookies with a rolling pin. Pour the crushed cookies into a medium bowl. Stir in the pecans and butter. Press the mixture into the bottom and 1/4-inch up the side of a 9-inch pie plate. Cut the remaining cookies in half. Place the cookie halves, cut-side down, around the inside edge of the pie plate. Refrigerate for 1 hour. Heat the chocolate and 1/4 cup milk in a 1-quart heavy saucepan over low heat until the chocolate is melted and the mixture is smooth, stirring often. Remove the saucepan from the heat and let cool to room temperature. Combine the pudding mix and the remaining milk in a large bowl and stir according to the package directions. Stir in the chocolate mixture. Fold in 1 cup whipped topping. Spoon the mixture into the cookie crust. Refrigerate for 3 hours or until the filling is set. 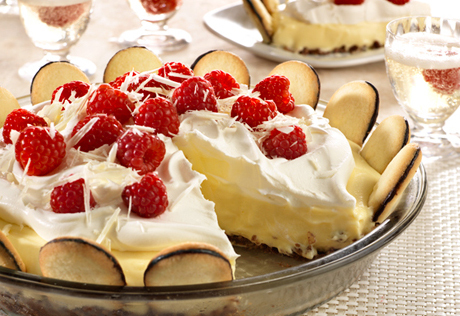 Top the pie with the remaining whipped topping, the raspberries and shaved chocolate.